Speaking as someone who isn't a tagahanga of the Shrek movies, I kind of mildly dislike all of them, equally. But I've never really seen why the fans of the franchise hate the third one so much. To me it doesn't really seem any better or worse than the rest. I've just been curious about this for a while. Well, the main reason being that the jokes aren't funny. The new characters (aside from Artie) are annoying, Charming is a lame villain, King Harold's death was VERY DISTASTEFUL, Artie making the villains become good is really out of no where and is WAY TOO easily accomplished, there is FAR TOO MUCH going on in the movie to the point where it's really unfocused and cluttered, Fiona is really underplayed, the whole Camelot college or whatever is pretty lame and stereotypical with no creativity to it like Far Far Away did, a lot of the dialogue is awkward, the pacing is inconsistent, is unmemorable, and a lot of dramatic moments just don't really pay off. If you want madami details, just go watch Doug Walker/The Nostalgia Critic's Dreamworks-uary video on it and he's not much of a tagahanga of the franchise aside from the segundo movie. While not awful, it's still really bad and definitely the worst in the franchise. True. 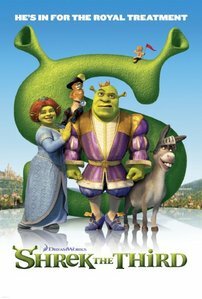 Notice how before Shrek came in Dreamworks tried different varied styles for their movies, but after Shrek took off they all turned into quirky CGI comedies. It would be long before we had a madami decent film (Kung Fu Panda). Not really, considering two 2D films came after Shrek, it was just the sequel that came after it that made it seem that way. Besides, I think something like Antz had madami to do with it because it was actually madami popular (for some reason) than A Bugs Life, which came out the same year. The main problem with Dreamworks pelikula for me (aside from a lot of the jokes being forced) is that neither the worlds or the characters are that interesting. Besides, even if the Shrek pelikula nailed the coffin on Dreamworks 2D animation, is that really a reason to hold against them? I mean, I'm not going to hate Merida because she was created to bash the past Disney Princess for being weak damsels in distress that depend on a man (as opposed to Merida who is a false action girl and a damsel in distress that has to be constantly saved sa pamamagitan ng her mother and her little brothers). Besides, let's face it, Dreamworks isn't exactly a company that has a style that bumagay 2D, since it's mainly slapstick and being supposedly "adult". I would pag-ibig to see madami 2D stuff from them but to be honest, while I do like them, none of their 2D films are very well-done or well-constructed, aside from The Prince of Egypt. Trust me, Shrek had VERY little to do with it.